Since its founding, Hirsh Precision Products has continually invested in advanced manufacturing technology. “We try to understand what the return is on certain new functions or features and be sure to take advantage of those innovations in a smart way,” said Chief Operating Officer Peter Doyle. Today the company has 22 CNC machine tools, distributed nearly evenly between mills and lathes. There are six production cells with three or four machines per cell. Five-axis machines are prominent, used largely for positioning that enables one-and-done machining. Positioning accuracy is critical in medical manufacturing for maintaining part registration, tolerances, and interrelationship of features. The shop makes parts ranging in size from 1mm turned components up to items as large as three feet, but “80 percent of our work will fit in the palm of your hand,” said Steven Hirsh, founderand Director of Engineering for the company. 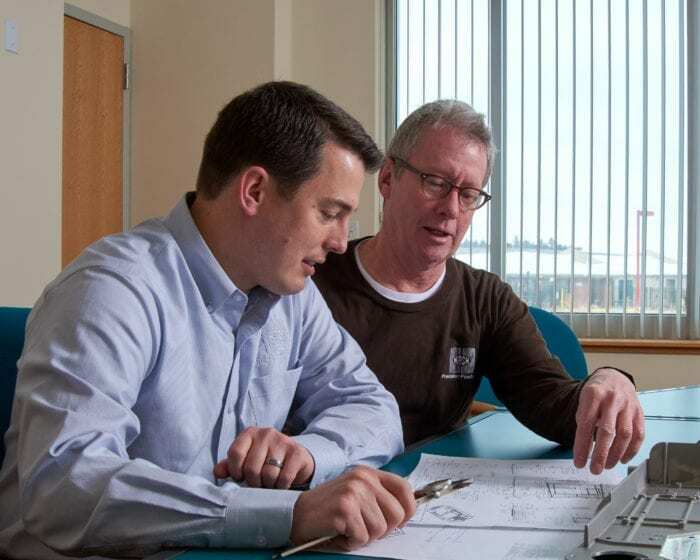 Hirsh Precision Products Chief Operating Officer Peter Doyle (left) and Director of Engineering Steve Hirsh discuss a new customer’s application. Hirsh Precision Products has always sought ways to automate its processes. Seeking to expand its application of FMS strategies, the company investigated options available in multi-machine FMS systems. “We go to IMTS every two years as a team to stay abreast of technology relevant to our customers and their parts,” Hirsh said. After thorough pre-show research, at IMTS 2016 the company purchased an FMS system consisting of an Okuma MU-4000 trunnion-style 5-axis CNC vertical machining center, featuring a 740 mm x 460 mm x 460 mm X-Y-Z work envelope, served by a model MDR-750 FMS ONE manufacturing system from FMS provider Fastems LLC. The shop has since acquired and installed a second MU-4000 mill on the Fastems system, which has thirty-six 400 mm diameter pallets, three levels of pallet storage and one LSC loading station. 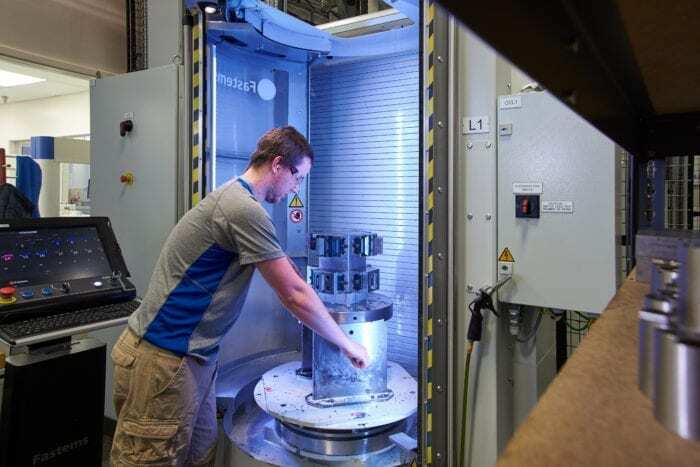 The system is expandable to handle five machine tools and 120 pallets. Hirsh Precision Products team member Sawyer Hayes secures pallet in the loading station of the shop’s MDR-750 FMS ONE manufacturing system from FMS provider Fastems LLC. Fastems Manufacturing Management Software (MMS) is the operational foundation of the system. MMS makes production prioritization decisions based on the availability of personnel, tools, machine time and raw material. It devises a schedule, moves pallets to and from the pallet racks, and directs machining of parts autonomously. “We communicate the due date and the quantity required,” Doyle said, “then MMS can ‘play chess’, look at the work that’s scheduled and come up with a plan that will meet the delivery dates, take advantage of the resources available, and maximize spindle time. That’s led to excellent spindle utilization.” The shop inputs its personnel schedules and the system retrieves finished parts when team members are available to unload them. “Operating Fastems highlighted for our team the importance of keeping the spindles running. Our job is organizing any required prerequisites, such as fixturing,” Doyle said. The multiple pallet system is a good match with the repetitive nature of most Hirsh parts. “Set-ups are one of the bigger variables for us,” Hirsh said. The shop can practically eliminate setup times by leaving fixturing intact on the pallets. “With 36 pallets, we can leave jobs set up. Changing pallets allows us to minimize lead times while maximizing utilization,” Hirsh said. In a study the shop performed on three typical part-making processes, setup hours showed reductions of 72 percent, 54 percent, and 92 percent with an average reduction of 73 percent. 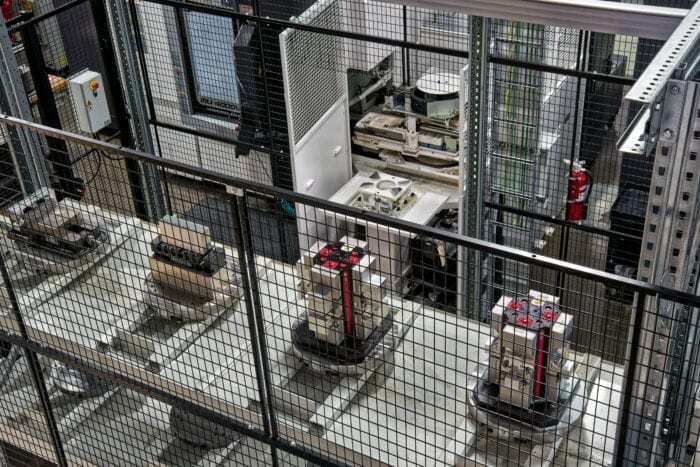 At Hirsh Precision Products, pallets preloaded with fixtures and parts await transfer via the Fastems MDR-750 FMS ONE manufacturing system to one of two Okuma MU-4000 5-axis CNC vertical machining centers. This is a shortened version of the full text that was originally published in Manufacturing Engineering – August 2018 Issue. Read the full story here.